Trying to do something different here. I'm going to discuss a character build that I had a lot of fun putting together and playing on 1.1 PotD (probably the most fun I've had in Deadfire so far), but I'm going to use it as an entrypoint to teach-by-doing various game mechanics and how to think about them and use them for your own builds. People already comfortable with min-maxing their way through Deadfire might not get much out of this, but hopefully for everyone else there's something useful here, because there's a lot of information scattered through this forum, reddit, and the in-game cyclopedia and I hope to consolidate some of it here and put them to actual use. In fact, I would say something like 90% of this is just going to be talking about game mechanics, because understanding the game mechanics thoroughly is key to understanding this character build. I hope you find this useful! July 4 2017 - Updated stats for patch 1.2. July 3 2017 - Partially updated for patch 1.2. 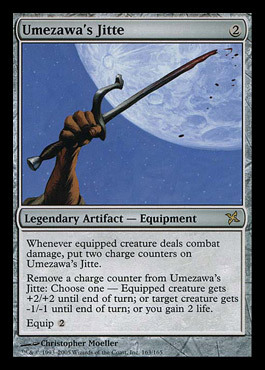 (*) If you're a M:TG lore purist out there, yes yes I know that the Umezawa on the left is not the Umezawa that the Jitte on the right is named for. 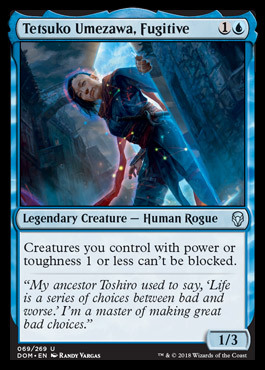 Even if you don't play Magic: The Gathering, the takeaway here is a fragile, weak, but elusive hero, and a stupidly powerful tool-kit of a weapon that the hero is lorewise linked to. I liked the idea of taking a very blue (crafty, subtle, evasive) approach to stupid levels of power, and decided to personify it in Deadfire as a Streetfighter/Wael multiclass that I'll just brand here as an Umezawa build. This character is very versatile and mobile, tanking on huge packs of enemies or jumping around behind enemy lines to assassinate troublesome foes. This character is not going to be great at doing burst or area of effect damage (at least until you have a steady supply of explosives), but it will do frankly a stupid amount of sustained damage, maximizing uptime for the Streetfighter's special (at least without resorting to just being a ranged blunderbuss dummy). While this is probably not the most powerful Streetfighter build you can make (a Streetfighter/Monk is probably better for pure damage) and is fairly micromanagement-intensive, it can nonetheless be a very fun and engaging way to play. Before diving into the mechanics of it all, let's just lay out the build order. SKILLS: roughly 2:1 ratio between Explosives to Alchemy. For your secondary skill, shove as much as you can into Religion, though you can respec out of this after a certain point. Be sure to pay 3000g each to train both Explosives and Alchemy. IMPORTANT ITEMS: Sparkcrackers and Cinder Bombs as explosives. Deadeye, Potion of Ascension, Potion of the Last Stand, Potion of Deftness, Potion of Impediment, and Potion of Piercing Strikes for alchemical goods. Mix in other stuff as desired. RECOMMENDED GEAR: Pukestabber, Frostfall Mace, Rust's Poignard, Animancer's Energy Blade, Bronlar's Phalanx, Wintertide Bulwark, etc or whatever else floats your boat. Once you have a bit more health and a bit more abilities under your belt, the playstyle is very aggressive. Instead of relying on Powder Burns, you'll rely on one of: blindly charging in and getting flanked; blindly charging in and getting your health pummeled really fast; or manually triggering your Streetfighter special by hitting yourself with Sparkcrackers or, in a pinch, Cinder Bombs. So depending on the situation, you might be tanking for your entire party, or you may be dodging back behind enemy lines to take out important casters. For boss fights, you'll drink a Potion of Impediment and try to pin the enemy down with repeated interrupts. This character is a "build-around" on the Streetfighter's special. To reiterate here, when you are flanked or bloodied, you get a special buff (Heating Up) which gives you a whopping -50% recovery time, along with a +50% damage bonus against sneak attack-enabled targets (effectively it is a souped up sneak attack damage bonus). If you are both flanked and bloodied, you get a special buff (On the Edge) which not only grants you the same bonuses as Heating Up but gives you a further +100% crit damage bonus. Both the damage bonuses are additive with other damage bonuses, so while they are certainly very good, it's not insane. The real star here is the -50% recovery time. -50% recovery time is equivalent to a whopping +100% action speed for your recovery, or the equivalent of getting +33 dexterity during your recovery. Furthermore, contrary to what you might think or read elsewhere, speed bonuses offer linear returns(*), so you can add on a bunch more recovery time reductions or action speed boosts and get to really fast levels (translating to high damage output). This is especially important for maximizing Potion of Impediment, which can really shine with a "Heating Up" Streetfighter's very fast attack speed. (*) Linear returns may end up being one of the most controversial things I'll say mechanically in this entire post, but is mathematically true and I will fight anyone who says otherwise . There'll be an appendix at the end that will go through the ugly math and details of it. But the way cast times work in Deadfire is that they generally follow a pattern where spells with faster cast times have longer recovery, and slower cast times have shorter recovery; this means that, ironically, a very slow spell cast (6s) will have a much shorter recovery time (typically 2s) than even a very fast cast spell (0.5s cast, up to 4.5s recovery). (The standard progression for spell timing is 3s cast/4.5s recovery, 4.5s cast/3s recovery, 6s cast/2s recovery so the total action time spent doing a spell cast monotonically increases with slower spells, even if the recovery is less.) This means that we can still get some benefit out of the Streetfighter's special if we focus on casting fast (3s) and some average (4.5s) spells, because shaving off 2.25s or 1.5s off your recovery is still incredible (shaving 2.25s off a fast spell cast is roughly equivalent to a +42% action speed or almost like taking three stacking copies of the Rapid Casting passive talent, even though it's all weighted towards the recovery phase instead of the cast phase). The major downsides to the Streetfighter are twofold, one explicit and one implicit. The explicit downside is that while you are neither flanked nor bloodied, you get a +20% recovery time penalty. The implicit downside is that to maximize the Streetfighter, you have to be at least flanked or bloodied which is generally a very dangerous situation to be in. This character focuses on letting you survive in those situations while trying to not take away from the Streetfighter's strengths. A really important piece of gear is actually your pet. The cosmo pirate pet (unlocked by doing the deadfire scavenger hunt or special non-achievement-disabling console commands) gives your main character a reduction in their armor penalty. The effect varies on armor, but this variance is because of the weird way it's implemented (which is identical to how a Fighter's Armored Grace is implemented). Internally, the game stores armor recovery penalties of +20%, +35%, and +55% roughly as coefficients of .83, .74, and .65. (What these numbers mean is not important right now.) Instead of applying a consistent effect on the listed recovery penalty, the cosmo pirate pet adds a flat .1 to these internal coefficients, which means these coefficients become .93, .84, and .75, which means the armor recovery penalty becomes +7%, +19%, and +34%. This means that the armor recovery penalty reduction is actually strongest for heavy armor, but that's not the important point here. The important part is the interaction with Miscreant's Leather (a light armor you can get for doing the first Principi quest by killing Benweth). Miscreant's Leather comes with a special enchantment that reduces recovery time by -10%. Theoretically, this was supposed to have the net effect of mitigating a majority(*) of the of the +20% light armor recovery time. However, with the cosmo pirate pig, your base armor recovery time penalty is +7%, which means the -10% recovery time enchantment makes wearing Miscreant's Leather actually faster than wearing any +0% recovery time clothing. (*) one of the ongoing confusions that one might have about recovery time is that you can't just add up your various recovery time adjustments and expect to get a sane answer. In fact, the best way to think about adjustments to your action time is that there is a different "native unit of measurement" depending on whether it's a bonus (either a +X% action speed or -Y% recovery time) or a penalty (either a -X% action speed or a +Y% recovery time). For bonuses, the native unit is "action speed," whereas for penalties the native unit is "action time." This is a weird distinction but is important for understanding how modifiers are combined. You can read the Appendix for further discussion. Anyway, for our purposes here what you need to know is that the -10% recovery time bonus needs to first be translated into its native unit as an action speed adjustment, or +11% action speed. The +20% light armor recovery time is in its correct native unit so we don't need to change it. Now (and for you people who took science classes in high school and pay attention to your bases/units this might hurt your head but is how Deadfire does it), you subtract the recovery time from the action speed and get a unitless -9%; because it's negative the effect is considered a recovery time penalty, and so the net effect of the -10% recovery time adjustment is that the armor effectively has a +9% recovery time penalty instead of a +20% recovery time penalty. TL;DR: a +20% recovery penalty combined with a -10% recovery time bonus does not equal a net +10% recovery penalty. In fact, the -10% recovery time bonus is actually more powerful than an equivalent recovery time penalty. This will come up again later, and I will go into further detail about the math then. So, as one of the few mandated pieces of gear, you should really have a cosmo pirate pig pet, and you should prioritize getting Miscreant's Leather. It will give you extra protection than cloth and be faster than cloth. Plus, it has a really useful enchantment for this build (Kidney Guard, which reduces received flanked damage by -10%). For the early part of the game before you get the leather, you should otherwise be in +0% recovery time clothing. If you're struggling a bit too much in early game, you can equip other light armor and the cosmo pirate pet. We now also have Epsilon as a good pet choice (available in Dunnage). In addition to reduced armory recovery time, its party-wide bonus is extra stride speed, which can be a much more useful bonus than Cosmo's firearms damage obnus. A hatchet and a blunderbuss (along with their proficiencies) are your absolute #1 priorities early on, followed up by a large shield. A hatchet is important because it provides a stacking +3 deflection against melee and its weapon modal applies a -10 accuracy (regardless of attack type) to the enemy, both of which you'll soon see is very important for this build. The blunderbuss is important because Powder Burns applies the Distracted affliction on you every time you attack, and conveniently for the Streetfighter, all Perception afflictions also apply Flanked which will trigger the Streetfighter special. (In fact, I'm sure many people have discovered you can create a stupidly good ranged attacker by just making a Streetfighter equip at least a blunderbuss.) Early on, using a blunderbuss at the start of the fight is a good, safe way to trigger the special, and the powder burns aoe damage is generally so low that it's ok to occasionally hit armored allies with it. Later on, Powder Burns is still a useful way to trigger your special in small fights or when you're isolated by yourself against important targets away from everyone else. An important pickle with gun reloads is that any adjustments to their reload speed is delayed by one reload. This means that after you fire your Powder Burns blunderbuss, the immediate next reload will not benefit from the -50% recovery time bonus. However, subsequent reloads will. I believe this also works in reverse. If you start reloading your blunderbuss while benefiting from the -50% recovery time bonus and Powder Burns wears off, you still benefit from the faster reload until the next time you need to reload (though by then you will already have refreshed it). For this character, you will want to dual-wield your blunderbuss with a melee weapon (early on, a hatchet). Because of game mechanics (even if it doesn't make logical sense), dual-wielding a melee weapon with a ranged weapon means that outside of melee range you only use your ranged weapon, and in melee range you only use your melee weapon, but you do both as if you were dual-wielding, so you get the -30% recovery time bonus from dual-wielding (plus an additional -15% recovery time bonus from two weapon style), even though you're just repeatedly attacking with the same weapon. In fact, in some parts of the game, you may have a melee weapon that is so good that you don't want to switch off with a weaker second melee weapon, which makes it a perfect candidate for pairing with a blunderbuss. In practice, it also means you can blunderbuss, melee, and then re-blunderbuss a ranged target (to re-trigger Powder Burns) without having to switch between weapon slots, which incurs a costly 2s recovery each time. This is a relatively painless (if micromanagement intensive) way to get 100% uptime with your Streetfighter special. Note that blunderbusses have a low range (4-5m, depending) so when you are in this melee/blunderbuss mode you should be cognizant of viable blunderbluss targets, particularly since for a good amount of that range your character will want to melee or take a step in order to melee. It is actually worth shooting your own allies (and positioning them close to do so) because for armored tanky allies they will take negligible damage that is well worth the continued uptime of Heating Up. In the worst case (if you're not engaged by your target), you can just step away from your target and fire at range. This downtime of running back and forth will still be outweighed by the significant damage boost you get from having constant uptime on your Heating Up effect. Do remember that for your first reload you need to give yourself 3-4s of time (depending on stats and gear) though subsequent reloads will only need a little more than a second. At level 4 you pick up large shield proficiency because this build has two very large weaknesses. I'll go into the second one later, but the first and most common weakness is enemy gunfire. See, this build leans on Arcane Veil heavily for protection, and Arcane Veil unfortunately offers no protection against "veil-piercing" attacks, of which enemy gunfire is the most common type. In such a situation, the large shield modal gives you an astounding defense against ranged attacks, -50% to ranged damage, on top of the natively large deflection bonus (coupled with Weapon and Shield Style) that will work against gunfire. It's such an extreme survivability difference that in any fight involving guns (at least early to mid game), you should switch to using a large shield and prioritize taking out the gunners. The downside to the large shield modal is that you are immobile, but fortunately we pick up Escape at level 1, which will let us hop around the map without having to toggle the large shield modal on and off (in addition to providing a nice, gun-effective deflection bonus for a short time). Note that even outside of gunners, many ranged attackers in Deadfire have stupidly high accuracy bonuses for their attacks that it may still be worth switching to large shield in ranged-heavy fights in early-to-mid game, both for the extra deflection, and for the significant damage mitigation. As you go up levels, you'll need to pick up some blunt weapon proficiency for damage diversity. I prefer flails and clubs for two reasons: they are fast (3s base recovery) and their weapon modals let you reduce enemy reflex or will by -25, which is huge. Clubs in particular are good because two of your most important spells (Despondent Blows and Devotions for the Faithful) target will. If you don't want your weapons lots to be oversubscribed, you can give a party member a club to do the debuffing for you. With some of the rebalancing that has occured since this guide was first written (especially PotD enemy scaling) a weakness that glass cannon builds like this have is penetration. On PotD enemies can sometimes have substantial armor, and if you can't penetrate their armor, a glass cannon can't do the high damage output needed to balance out its relative fragility, which means you're just a fragile character with little upside. As a result, I no longer recommend fast blunt weapons, which lack penetration weapon modals. Instead I recommend diving into maces (which have high inherent penetration and whose weapon modal debuffs armor for everyone in the party), sabres (for access to Animancer's Energy Blade, which does raw damage; you don't technically need the weapon proficiency to take advantage of this, but sabres are just a good class of weapon to have proficiency with early on), and/or stilettos (high inherent penetration, access to Rust's Poignard). Both stilettos and sabres benefit from the Fair Favor hat, which this build already uses. In addition, as I'll mention later, I recommend picking up Champion's Boon instead of Searing Seal for the extra penetration from the Tenacious inspiration. This character will also pick up dagger proficiency. For reasons that I'll elaborate on in a moment, the weapon modal isn't too important, but what is valuable is getting the Fair Favor hat and getting a Marux Amanth soulbound to your priest class. Fair Favor gives you hit-to-crit and bonus crit damage with daggers (among other weapons). Marux Amanth has very useful abilities for this character when fully unlocked: Worthy Sacrifice (which is an instakill against Near Death targets if you hit them), Corona of the Soul (10% chance for a decent burn aoe effect), and Echoes of Faith (10% chance to re-cast any priest spell a half second after the initial cast). Echoes of Faith is a particularly good ability; 10% isn't very common, but when it does happen can be a tide-changingly good effect. We actually pick up certain spells basically because they would be really good to have duplicated (Pillar of Faith, Pillar of Holy Fire, Cleansing Flame). Still others get good benefit (Salvation of Time), and at the very least you get double chances to afflict enemies with Despondent Blows or Devotions for the Faithful. Corona of the Soul is also a decent ability and works well with this character because we will be attacking so fast that we'll be close to maximizing the number of times we can proc the burn aoe (which does ~10-20 in about ~1.5m) in any given amount of time(*). As an extra plus, imagine that the Marux Amanth is the Deadfire equivalent of Umezawa's Jitte from above . (*) Funnily enough, while trying to test some Deathblows-related issues, I discovered that Corona of the Soul has its damage boosted by damage modifiers that affect any weapon, including Deathblows itself (and any lash effect). This appears to apply to any weapon-based proc. (See below screenshots--click to enlarge--the left is a Corona of the Soul proc in the combat log and the right is a Sungrazer proc in the combat log, though unlike Corona of the Soul it doesn't have a special name in the combat log. I also tested some other procs and verified those get boosted, too.) This is both a general thing to keep in mind for your own builds, especially rogues who can sneak attack and Deathblows, but is especially good for a Streetfighter who can easily get an additional +50% from Heating Up and a further +100% from critting while On The Edge. As far as other unique weapons go, steal Xoti's Sickle as soon as you can, you'll be able to put better use to it. Not only does it have the benefit of having two damage types unlike other hatchets (giving you much-needed damage diversity), but its power-up effect (additive +5% plus .5% per religion skill to sickle damage until end of fight, up to 4 stacks) is very good and likely to trigger since this character will be doing a lot of finishing blows. I highly recommend you enchant it to have Urgent Harvest, which gives you 15% plus .5% per religion skill action speed bonus to Xoti's Sickle the moment any enemy dies anywhere, regardless of whether or not you did the killing blow. Importantly, due to stacking rules (which I'll go into further later), this combines with the Streetfighter special, with Potions of Deftness, etc so you can get stupidly fast attack speeds with the sickle. Mid-to-late game better hatchet options will open up. Acolyte's can be straight up better than a Xoti's Sickle because its Freezing Lash is always active (whereas Xoti's Sickle needs to power up upon kills) and is a multiplicative bonus with the total damage you did, which means a +15% freeze damage lash is worth much more than a +15% xoti's sickle damage. The combination of sneak attack damage (up to +60% additive) and Streetfighter special (another +50% additive) and possibly the Streetfighter On the Edge bonus (another +100% additive from crits) can make that lash worth more than a fully-powered up xoti's sickle. Later on when you have more survivability tools at your disposal and the +3 deflection bonus from a hatchet (or +6 from two hatchets) is less important and the -10 accuracy weapon modal more redundant, you can start ignoring hatchets all together. I like pairing Marux Amanth and Pukestabber together; when Pukestabber is enchanted with Mad Drunk, while under the effects of alcohol, both daggers will have +20% additive damage and +20% action speed; plus, both of them will benefit from the Fair Favor hat. Regardless of what weapons you choose, you'll have three weapon slots each with an important role: one that has a blunderbuss/melee pair, one for dual-wielding, and one for a large shield. Your dual-wielding one will be your main slot past the early game, but you'll need to be ready to switch to one of the other slots as the situation demands. And be sure to have damage type diversity, because this character will lose a lot of steam if you're stuck in a 25% No Pen situation against most of the foes in an encounter. In fact, I recommend keeping your high penetration backup weapon as your blunderbuss/melee pair - this is essentially your "boss mode" set up where you can both do high penetration and trigger self-flank at will throughout a long fight without having to repeatedly weapon switch. There have been some random changes to how dual-wielding a ranged weapon and a melee weapon work. First, you can no longer attack destructibles at range if you are main-handing a melee weapon; your ranged weapon must be in your main hand. Second and more relevantly for this build, you cannot actually engage enemies unless you are main-handing a melee weapon. This is important because a good crutch for this build was to main-hand the blunderbuss, so that the range indicator properly indicates the range of the firearm so you know how far away to go before it's too far when trying to trigger Powder Burns. You can still do that, but you can no longer engage foes if you do this. Since engagement can be pretty important, if you don't need the visual aid of the blunderbuss range indicator, you should main-hand a melee weapon and keep the blunderbuss in your off-hand. The basic point of this character is getting into dangerous situations to trigger the Streetfighter special and then surviving, which is a harder task when playing on Veteran or Path of the Damned. Before we dive into the many tools that we'll lean on, we need to talk about how effect stacking works in Deadfire. On the face of it, the rule is pretty simple, paraphrasing the in-game cyclopedia: all passive effects stack, but the highest active effect suppresses all other active effects. While the rule is simple, the devil is in the details and thinking through the implications of this is important for your own gameplay. A "passive effect" can be thought of as constant item effects (like a Ring of Minor Deflection), innately triggered item effects (like Xoti's Sickle's Urgent Harvest or its damage boost or Entonia Signet Ring's defense bonuses), and passive class abilities (anything in the passive column and always-on innate effects like the Helwalker's might bonus from wounds). Everything else is an active effect, including weapon modals, paladin auras, and stances. This means that any given time, you can have around a 85-point net swing in your relative deflection to the enemy's accuracy. This is by combining Arcane Veil, a resolve inspiration, a Despondent Blows debuff on the enemy, and a perception affliction on the enemy, though you will likely also have a constant -10 from being flanked. Still a 75-point net swing after being flanked is still pretty huge and this is still ignoring stackable passive effects like the hatchet innate weapon bonus (+3 deflection against melee), Entonia Signet Ring (+2 all defenses per enemy engaging you [which is different from enemies that you engage]), a large shield with weapon and shield style (+12, +6, plus an additional +2 per large shield enchantment level), Cloak of Deflection (+7), Minor Ring of Deflection (+2), Shorewalker Sandals (+1 resolve), etc. However, this also means that if you have Mirror Image active, there is no reason to have your dagger modal active. If you've hit all the enemies nearby with a blinded affliction, there is literally no reason to have your hatchet modal active and casting Devotions for the Faithful could potentially just be a waste of time. Juggling all these various stacking effects will constitute a good chunk of the micromanagement of this character. You certainly could just leave your dagger or hatchet modal on all the time, but you'd be giving up a significant chunk of damage unnecessarily. Now, a big question is, say all enemies nearby are hit with Devotions for the Faithful (-10 accuracy); is it worth the opportunity cost(*) of casting Despondent Blows on top of that (it would be a net change of an additional -5 accuracy)? Similarly, if you are already protected by Arcane Veil, is it worth the time to get a resolve inspiration? The answer, my friend is that defenses offer increasing returns(**). Basically, look at the combat log. If the enemies don't have too much of a negative penalty to their attack roll, then it's probably not worth it. If they have a pretty huge negative penalty (but less than -75), then yes it's probably worth it. Even then, this guideline isn't perfect because if you're trying to get hit to get low enough health to trigger On the Edge or a perma-Heating Up (common later on in the game), then you may never find it worth it to cast even the hard-hitting stuff to begin with. (*) "Opportunity cost" is a crucial concept for this character, and an important concept for any other character. There's an idea that there's an "action economy" in games like Deadfire, that is, you only have enough time to do so many things before combat ends, one way or the other. You certainly could cast every single buff or debuff in your arsenal willy-nilly, but then you'll spend actually very little doing anything of import. When you eventually are able to attack about once/second for a significant amount of damage (40-50 a pop, with potential Corona of the Soul triggers), you'll have to judge very carefully whether it's worth instead spending 3-6 seconds (i.e. giving up 150-300 damage) by casting a spell or using an ability. (**) Defenses offer increasing returns because of the way attack rolls work in Pillars/Deadfire. The higher the relative defenses to an attacker, the more significant each additional point of defense becomes. A pair of examples illustrating this: let's say you have 0 defense against an attacker with 25 accuracy. What would the impact of 5 additional defense be? Well, with Deadfire's rolls, you'll go from being graze/hit/crit by the attacker 100% of the time to 95% of the time. Not much of a change in your total survivability. Now, let's say that you have 95 defense against that same attacker. What would the impact of 5 additional defense be? You'll go from being grazed 5% of the time to never being touched ever again. You will have gone from having finite--if huge--survivability to literally infinite survivability: that enemy could attack you until the heat death of the universe and they will never so much as reduce your health by 1 point, where with a 5% chance to graze they could probably kill you within an hour if you do nothing but stand there. This might sound like an absurd example, but for many types of "The Ultimate" runs for Pillars of Eternity 1 (beat the entire game solo on the hardest difficulty in iron man mode) some fights could literally last for more than an hour and the difference between being grazed 5% of the time and never being touched could be the difference between a successful run and one that fails after many hours of playing. Plus, when you are surrounded by enemies in melee and targeted by enemies at range, even a 5% chance to be grazed can be significant; when there are ten enemies on the battlefield one will be expected to graze you every other attack, which will quickly add up to something fatal if you aren't killing things quickly). If you played Pillars of Eternity 1 with a priest, you'll be forgiven for ignoring Barring Death's Door and similar effects in Deadfire, since the effect in Pillars 1 was pretty lame. All they did was prevent you from dying, and dying in Pillars of Eternity 1 meant getting knocked down to 0 health (as opposed to 0 endurance), which would have been a permadeath instead of just a knockout. What Barring Death's Door and similar effects do in Deadfire is prevent anything from reducing your health below 1 (even instant kill effects from something like Death Ring). Fortunately for the Streetfighter, one way to trigger Heating Up is to get Bloodied or lower, and the only way to get On The Edge is a combination of being Bloodied or lower and being flanked. Both Barring Death's Door and Potion of the Final Stand give us a nearly foolproof way to trigger Heating Up and sustain On The Edge. But both Potion of the Final Stand and Barring Death's Door have low base duration. It's for this reason why we pick up something like Prayer for the Spirit (+5 intellect means an extra +25% of base duration for Barring Death's Door), invest in Alchemy (+5% duration per point in Alchemy to Potion of the Final Stand), and love food/drink like Meppu/Roe (+15% beneficial effect duration, additively stacks with intellect and power level scaling) and importantly why one of our most important late-game spells is Salvation of Time (+10 seconds to beneficial effects but as of 1.2 actually grants +20 seconds at least the first time you cast it per encounter). This stuff also helps Arcane Veil--which has a fairly short duration as well--but is more critical for these "can not die" effects because the moment they wear off with you at 1 health, you are probably going to be knocked out. This leads to the second of this character's weaknesses, and it is Arcane Dampener. It's not too common for much of the game, but during the Paradise of the Mind quest and Nemnok the Devourer quest, literally every enemy wizard will try to hit you (and especially this character) with Arcane Dampener at least once; will Arcane Dampener temporarily suspend any current protections for a long time. You can try to hope that your will defense--which will be sizable thanks to a high intellect (buffed further by Prayer for the Spirit)--protects you, but this hope is dangerous because even a graze will dispel all your protections for a few seconds, which is more than enough time for you to be interrupt-locked to your death. You have two main approaches. First, you can try to use Smoke Veil to go invisible the moment you see the Arcane Dampener icon appear above wizards' heads (they tend to all cast it at the start of the fight, so if you see one you will probably see a lot) and let the enemy wizards re-target it to another member of your party who is less reliant on spell protection for survival. Second, you can try to use Smoke Grenade/Smoke Cloud or something like Grenades or Concussion Bombs to interrupt them while they are trying to cast it. This is very risky because if you miss you don't get another chance to interrupt them, so generally prefer the first approach. Either way, you should then eliminate the enemy wizards with extreme prejudice, because some of them will hang on to their third level spell cast to try again later. (*) Note that patch 1.2 significantly weakened the effects of Deadeye and Potion of Deftness (no additional accuracy from alchemy) and somewhat weakened Sparkcrackers (no extra duration scaling from intellect). (*) This point comes up again and seems confusing, and is a minor disagreement I have with MaxQuest's otherwise excellent work on action speed; in the pinned post he asserts that all maluses (through something he calls "double-inversion") are stronger than their equivalent magnitude bonuses. This may be true for damage, but is not quite the right way to think about this in terms of action/recovery because action/recovery has different "native units" depending on whether it's a bonus or a penalty. The true complexity is left for the appendix, but for here it serves us just to remind you that because of the different "native units" a -50% recovery time bonus is not countered by a +50% recovery time penalty. Instead, if you are at all familiar with investing or finance, it's related to why if your investment loses 10% of its value one year, you actually need more than a 10% gain the following year to make up for it, because you're starting from a smaller base. In fact, let's stick with this investment analogy and swap in numbers from Deadfire here: imagine you had $1000 worth of stocks that lost 50% of its value one year. What return would you need the next year to make it back? If you lost 50% of your $1000, you are down to $500. So you would actually need a 100% return (doubling your money) the next year to get your money back. And in fact, this holds true for the blinded/Heating Up interaction. For the blinded affliction to cancel out the -50% Streetfighter recovery time bonus, it would need to be a +100% recovery time penalty. Sure enough, you can verify this in-game by looking at your weapon recovery time and then blinding yourself. Even though you have a +50% time penalty from being blinded your recovery time will go significantly down. 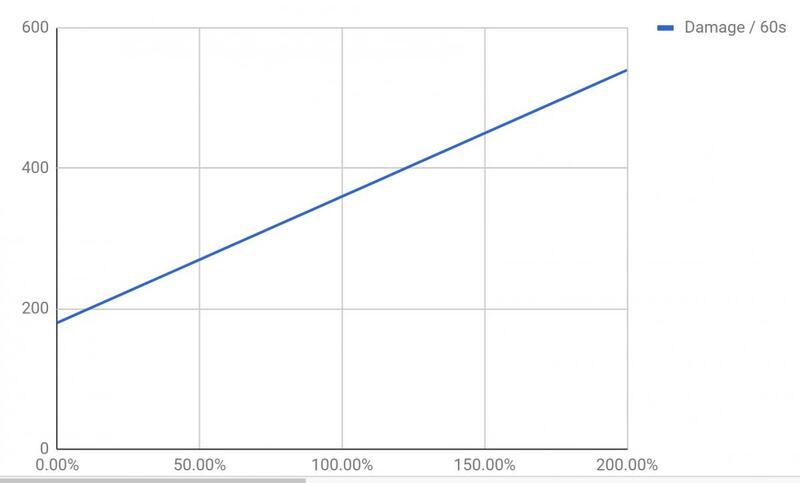 To get the magnitude of the specific effect, we have to convert to our native units; -50% recovery time bonus is natively a +100% action speed during your recovery; a +50% recovery time penalty is already in its correct native unit; we take the +100% and subtract the +50% recovery time penalty; the answer is positive, so we treat it as an action speed adjustment of +50%, or a net recovery time bonus of -33% which is still significant. Yes, this math is weird. Other than those explosives, you should load up on whatever else floats your boat. Remember that, like weapons, explosives have a short action time and a longer recovery, so the Streetfighter with their special will be able to spam explosives like nobody's business. because of this Grenade and Concussion Bombs are a little less useful than others because spamming bombs is a little harder to do when Grenade and Concussion bombs are knocking everyone around. (*) As of patch 1.2, Devotions for the Faithful's +10 accuracy bonus is the best active common accuracy bonus that I can immediately think of. This is because patch 1.2 significantly nerfed all consumables but in particular Deadeye and Potion of Deftness by no longer letting their accuracy bonuses scale upwards with your alchemy skill, so Devotions's +10 bonus got significantly better as a result. In addition, Devotions is special because most other accuracy bonuses come from being perception inspirations (like Fighter's Disciplined Barrage), so the +10 accuracy will stack freely with other perception inspirations and importantly for this build won't counter perception afflictions. Potions for the Final Stand are a good, if uncommon, supplement to Barring Death's Door (and your main option--aside from a friendly Shieldbearer Paladin--before you get Barring Death's Door). Potion of Impediment meshes extremely well with the Streetfighter's ultra-low-recovery rate for weapon attacks; as of 1.2 you no longer get effect scaling with alchemy but with a 30% interrupt chance and a fast attack rate you can still prevent a dangerous enemy from getting much done (interrupts, in addition to countering any active ability adds a little extra time to their current recovery). And lastly, a major weakness is that the Streetfighter/Wael lacks a lot of good ways to penetrate enemy armor (you won't be picking up any weapon modals that give you bonus penetration, and there are no armor penetration skills), so when you can, keep a Potion of Piercing Strikes ready to give you bonus penetration for big, hard fights. (*) For much of the game, you'll also want Potions of Minor Healing (nothing stronger) just to help you when your health gets too low. (*) Due to the fact that damage maluses are significantly stronger than damage bonuses due to double-inversion, under-penetration can lead to severe loss of damage. 25% underpenetration cancels out upwards of +300% worth of damage bonuses (it's a similar situation to a -75% recovery time bonus requiring an equivalent +300% recovery time penalty to cancel out), which is well more than what even a Streetfighter that is On the Edge and critically sneak attacking can put out. Even just going up to a 50% underpenetration (which only cancels out +100% worth of damage bonuses) can actually more than double your damage output. E.G. a neutral might, level 20 streetfighter/wael on the edge, sneak attacking, critically hitting, at 25% underpenetration would have a net damage adjustment of almost -40% (-3 + .6 + .5 + 1 + .25 = -.65 => 1/1.65 = .61 => -39%) whereas just managing to go up to even 50% underpenetration would have a net damage adjustment of +35% (-1 + .6 + .5 + 1 + .25 = 1.35 => +35%) which is a 2.25x increase in damage. Shows you how important penetration can be. As mentioned before, we pick up Pillar of Faith, Pillar of Holy Fire, and Cleansing Flame just to do some extra damage and cause some interrupts (for Pillar of Faith), and hopefully trigger a Marux Amanth double-cast. Remember that opportunity cost is very important; make sure with all of these that you are doing something that, on its own, is worth giving up the melee damage you are foregoing by not auto-attacking instead. For Pillar of Faith, that means trying to interrupt several enemies in one go (remember that the prone itself targets Fortitude whereas the damage targets Reflex). Pillar of Holy Fire against groups of enemies (and potentially yourself if you're trying to trigger Bloodied). Cleansing Flame to eliminate enemy buffs and when it looks likely you'll get some good jumps off of it. Holy Meditation is just for some early resolve inspiration if needed, and later on as a way to cancel out a growing number of ways that enemies can Terrify your party. This character doesn't have many offensive abilities, so Frightened is not actually that big a deal, though the resolve hit can be a liability. Searing Seal is there as an additional source of blind and a way to lure enemies and blind them for free. That's because if you cast a spell outside of combat and you stay out of combat for a few seconds, you get that spent resource back. For many abilities this is not too useful. Seals, however, have a long duration. So you can cast it, wait for your resource to come back, and either lure enemies into it or wait for them to walk over and be hit by it. In fact, so long as you cast it a decent distance from enemies away, but still close enough to alert them by its noise, they will walk over the seal and be affected just after you get your 5th level spell cast restored. Because your 5th power level of spells is going to be oversubscribed (Barring Death's Door is just so good in this build), an opportunity for a free blind is too good to ignore. I no longer recommend Searing Seal and instead recommend Champion's Boon. Champion's Boon solves several problems for us. First, it gives us +2 penetration from its Tenacious inspiration; this won't stack with a sabre or stiletto weapon modal, but will stack with the mace effect (because the mace gets extra penetration by implementing it as a debuff on the enemy, not as a buff on yourself) and importantly is the only consistent way we have to boost the penetration of daggers. In fact, for daggers this is better than a weapon modal because most other bonus penetration weapon modals give you a significant recovery penalty, whereas Tenacious gives us the +2 penetration without any drawback. The second and smaller perk is that Champion's Boon gives us +3 engagement. Combined with Persistent Distraction, this means up to four nearby enemies will be Distracted. Combined with the inherent Resolute inspiration Champion's Boon gives you, this is a net 10-point hit chance swing in your favor, in a way that stacks with accuracy penalties from Despondent Blows or Devotions of the Faithful or the hatchet weapon modal. It also means your Riposte attacks have an easier chance to hit on virtually anyone attacking you. The downside to this choice is that we no longer have a "free" spell like we did with Searing Seal. Because Barring Death's Door is so important for survival, you really should evaluate your combat situation carefully and weigh whether or not you are going to need the bonus penetration or you're going to need to prevent death/trigger On The Edge. We pick up Smoke Cloud solely as a prerequisite for Smoke Grenade. And we pick up Smoke Grenade for two reasons: as an additional fast interrupt, and as a way to help enable Deathblows. Persistent Distraction will take care of Deathblows for you automatically (the free flanked that perception afflictions bestow counts as a second affliction), but Smoke Grenade will be useful for triggering Deathblows on enemies you are not able to engage and for situations where the enemy is resistant to perception afflictions (you get the weakened effect from Smoke Grenade, and then rely on either manual flanking or some other explosive or party member to apply another affliction). If you have no problem with keeping near 100% Deathblows up-time without Smoke Grenade's help and don't mind the friendly fire, you can pick up Pernicious Cloud instead for the extra damage. I added a story choice to the build--to be snarky at the gods when they first summon you after leaving Port Maje. This is because this unlocks the Wit of Death's Herald upgrade to your Death's Herald watcher ability (it also fits in with Wael's preferred disposition of being clever, coincidentally). Wit of Death's Herald adds on an intellect inspiration to the base effect, so is a "free" way to cast Prayer for the Spirit once/rest without using up a PL3 slot. A lower resolve means we're going to get hit more regardless of what we do, so we don't dump constitution anymore. We don't have the spare points to invest in it, but we also don't want to make ourselves squisher than we need to be. In fact we pick up Tough later on for extra buffer room against high-impact enemy spells/abilities, but it's really a double-edged sword. More health means you can stay at Bloodied or below for longer, and there's more room for mistakes (like not paying attention to the fact that your Arcane Veil just ran out or that your Arcane Veil isn't doing anything because the enemy is using guns even while you melee them), but it also means it takes a lot longer to get to Bloodied. Whatever might adjustments you make here will be generally dwarfed by the huge amount of damage bonuses you'll get from a Streetfighter sneak attack (the base +30% plus power level scaling, plus the +50% from the Heating Up special). We opt for a neutral score to put the points elsewhere (and we want to avoid a penalty because damage penalties are stronger than bonuses). Wood elf background is pretty important for its Dexterity affliction resistance. This character really wants mobility, and being able to shrug off hobbling, and convert a near-lethal Paralyze into a not-bad-at-all Immobilize is pretty valuable. You can find gear that provides Dexterity resistance, but this way you can reserve those inventory slots for more interesting stuff. Whew! That was a lot of text to read. If you made it this far, congratulations! And I hope you learned a thing or two. If this build still sounds really abstract to you, here are a couple typical examples of mid-to-high level encounters and how an Umezawa would handle it. 0. already affected by deadeye. 1. main tank charges in, unstealthed, while Umezawa is still stealthed. Targets self with a Sparkcrackers with ~70% accuracy (which is almost a guarantee to graze/hit, and the will effect will be likely to at least graze), if the main tank pulled right maybe an enemy gets affected too. 2. Escape towards the bulk of the enemies. While you still have the +50 Escape bonus active, make sure hatchet modal is enabled (in case Riposte procs you can debuff enemy accuracy), and then self-buff with Prayer for the Spirit and then cast Despondent Blows before disabling your hatchet modal and then casting Arcane Veil. 3. DPS everything down. Throw some bombs if you feel like it. Re-cast Arcane Veil if necessary. If fight is still going on and you're out of Arcane Veil, self-empower, chain Escapes together, use Mirror Image, etc. 1. Charge in. Notice that casters start casting Arcane Dampener. 2. Use Smoke Veil to go invisible. Continue to run Umezawa towards the back while the Arcane Dampener gets retargeted to your other party members. 3. Unstealth by throwing Sparkcrackers at point-blank range with one of the back casters, hopefully affecting yourself with Distraction. Cast Prayer For the Spirit, then Barring Death's Door as enemies reconverge on you. 4. Let them bring you down to 1 health and flank you while you DPS the caster down (you can also self-target with Pillar of Holy Fire to help bring your health down), and Escape to target the next caster. If you see another Arcane Dampener start getting fired, use Smoke Veil or Smoke Grenade. 5. When all the casters are gone, DPS everything else down. Use Salvation of Time for extra Barring Death's Door time. If you're in a situation where Riposte could be relevant and you're already at 1 health, go ahead and use Arcane Veil just for the added damage from your counterattacks. If you run out of Salvations of Time and Barring Death's Door, self-empower for another round of both. SCENARIO: "deal with it" nemnok fight. 1. Let main tank unstealth and trigger everything. 2. While stealthed, Umezawa either Powder Burns or self-Sparkcrackers. 3. Carpet bomb the area with Lightning Bombs and whatever else you got (Immolator, Frost Bombs, Blister Bomb) and mix in a couple of Smoke Grenades to lower enemy fort/reflex and reduce their ability to heal back from this hellscape you're creating. 4. Watch the entire enemy fight disappear under a hail of bombs exploding every other second. 0. Start off with deadeye already enabled. 1. Start off with your melee/blunderbuss weapon slot, the melee weapon being a fast (base 3s recovery) weapon. If you are able to land a non-graze self-sparkcrackers, switch to your dual-wield. Otherwise stay with this weapon slot and just find ways to keep Powder Burns uptime for the rest of this scenario. 3. Attack the enemy with a fast weapon. While as of 1.2 you won't completely interrupt-lock the enemy, attacking almost every second with a 40% chance to interrupt will turn down the danger level of any given tough enemy a lot. 4. Use Salvation of Time if necessary. Use Cinder Bomb, Pillar of Holy Fire, or other explosive to get your health down if you also want to be On The Edge while doing this. After having dug up how monastic unarmed training works, I suggest two alternatives that rely on picking up Monastic Unarmed Training instead of Fast Runner. (You can pick up Fast Runner later in lieu of e.g. Holy Meditation or Pillar of Faith). TL;DR: Monastic Unarmed Training gives you potentially extremely fast, high-penetration weapons, but you need to find bonus sources of PL to really get mileage out of it (ideally at least +3, hopefully even +6). Until you pick up Champion's Boon you are going to a friendly party member who can buff you with a body inspiration, but you get +1 PL, and then you can get up to another +2 PL from either food (+1 PL) or a Potion of Ascension (+2 PL). +2 PL is enough to get you better-than-superb fists pretty early on, though not quite enough to get better-than-legendary, so you'd need to start crafting/buying Potions of Ascension on a regular basis to get to better-than-legendary scaling (at level 19). This is the "consistent" option, but is dependent on party composition. For much of the game you won't get much bonus PL, but once you unlock Barring Death's Door, you can hover around Near Death for +3 PL, with the possibility of another +2 PL form either food (+1 PL) or a Potion of Ascension (+2 PL). +3 PL is enough to get you better-than-legendary fists by the end of the game (level 19), and conditionally +5 PL will get that for you by level 13. Unfortunately I don't think there exists another way to stack on another +1 PL to get better-than-mythic fists by the end of the game, at least without exploiting a bug(*). If there does exist another source, do let me know (it would have to be a non-class/keyword-specific PL bonus that comes from an item). This is the "spikey" option, but doesn't require you to have a body-inspiration-buffing-capable party member. (*) The Heart-Chime Amulet (reward for Pallegina's quest) is supposed to give you a variable bonus as a godlike or watcher, but is currently bugged to always give you the bonus that a Moon Godlike should get, which is a +1 PL stackable bonus. You can use it here to get +6 PL, but be warned that Obsidian will fix this bug and it's only a matter of time before this loophole goes away. In either option your main dual-wielding set of weapons will be your fists, which you can treat as fast blunt weapons with bonus inherent accuracy, damage, and penetration and a +30% damage lash. The weapon modal proficiency for fists is an additional +2 penetration, so you could theoretically re-drop Champion's Boon and bring back Searing Seal. You'll have a strong early game due to how the monastic unarmed training talent works, and the bonus PL will help ensure that you continue to scale at a reasonable pace. Though you need to be a Death Godlike comfortable with dancing with Barring Death's Door to really take advantage of it; fortunately for this build lots of good things happen at near death, so you'd be really leaning into that "glass cannon" philosophy. You're giving up a head slot, but this build was mostly using it for Fair Favor, which you don't need if you're busy punching everything in the face. One immediate alternative approach to an Umezawa build you might think of is to pair a Streetfighter with an Illusionist, or at least a Wizard. You get a lot more opportunity-cost-worth-it damage spells and ways to afflict enemies. You also get Infuse With Vital Essence with is like a super-charged version of Prayer for the Spirit (since you are mostly using it as a self-buff in this build anyway). Plus, the Wizard has access to Wizard's Double, which, with a sufficiently high deflection, its duration-less unconditional +40 deflection is the best defensive spell you can use. The problem is that the Wizard actually has its defensive spells inefficiently distributed for our purposes. Both Arcane Veil and Mirror Image are at PL2, which means a Priest of Wael actually effectively gets twice as many casts as the wizard, since for the priest Arcane Veil is at PL1 and Mirror Image is at PL3. The fact that Arcane Veil is a PL1 is also a bigger deal than you may think. For one, early-game (Port Maje) 1.1 Path of the Damned is a fair challenge, and a wizard multiclass won't get two casts of PL2 spells until level 7, which is after when you probably most desperately need it. In addition, there are several resting effects in the game that give you a bonus +1 level spell cast (The Wild Mare and the Luminous Adra Bathhouse immediately come to mind). This is great for a Priest of Wael because it potentially means 3 casts of Arcane Veil, plus an additional 2 upon a self-empower. There's basically no equivalent for a wizard. And while Wizard's Double is good, it won't be that good for much of the early game because your deflection just won't be high enough to really milk it for what it's worth, and by the time you can take advantage of it, the Wael version will be picking up new tricks. Speaking of which, wizards lack the following spells that really help tie the Umezawa together: Despondent Blows, Devotions for the Faithful, Barring Death's Door, and Salvation of Time. It makes for some great general party utility and combat versatility. While I'm sure there is a great Streetfighter/Wizard build out there, I am fairly confident that for this specific playstyle (as opposed to an immortal high-deflection riposte build, which a wizard could do better) Streetfighter/Wael is the way to go. The Umezawa build as of now is also not a solo PotD build. A soloable version of Umezawa would be closer to an immortal, high-deflection riposte build, because the way this build is now the Umezawa is a team player. Frankly, without a lot of delicate pulling of enemies or just constantly equipping a large shield, there's just no way that the Umezawa can sustain all the enemy hate in the world because while your deflection is high to mitigate a significant portion of damage, it's not going to be high enough. Even with access to Barring Death's Door, encounters would probably just take too long and you'll be left out of steam with enemies still standing. Umezawa can work great in smaller-than-5 parties, but a completely soloable build would likely be unrecognizable to the one being presented here today. Abydon: not recommended. This build leans hard on certain unique weapons and armor and you can really run up an expensive repair bill versus other characters that can use generics instead. Berath: nothing relevant to worry about. Eothas: nothing relevant to worry about. Galawain: be on the look out for Unstoppable and Bullish enemies. Unstoppable can't be afflicted, but they can be flanked; important to keep in mind for keeping your DPS up. Bullish enemies interrupt and knock back at will, so make sure you don't drop your best deflection bonuses (Arcane Veil or Escape) before trying to cast something at point-blank range. Magran: if you can pull off this build along with a party on this challenge you should probably quit your job and become a professional DOTA or Starcraft 2 player. Skaen: if you want to use this character to help illuminate things, the sabre proficiency is more important early on, and then you can use the sabre-torch. If you don't have access to the sabre-torch, well... *shrug*. Normal torches are still usable but represent a huge DPS loss. I made the assertion earlier that speed adjustments offers linear returns. I've fought similar debates re: World of Warcraft and Diablo 3, and I'll fight it again now. But before we go onto my analysis and conclusion, we need to be clear what we mean by "linear returns." If you've taken calculus, then the easiest way to express what "linear returns" means is that for a given differentiable function f where f'' is the second-derivative and f consumes a stat x to yield a metric y, then if f(x) = y, ∃x₀: ∀x > x₀ f''(x) = 0. Putting it into words, we mean that after a certain point for x the second-derivative of f(x) is 0. Analogously, "increasing returns" is when f''(x) > 0, and "diminishing returns" is when f''(x) < 0. Put in less math-y speak, a stat has "linear returns" when for a given absolute change in that stat, the resultant metric always yields the same absolute change as well, regardless of what our starting point was. By contrast a stat has "increasing returns" when for a given absolute change in the stat, the resultant metric yields continually larger absolute changes the higher our initial stat was. Similarly a stat has "diminishing returns" when for a given absolute change in the state, the resultant metric yields continually smaller absolute changes the higher our initial stat was. A key point to this is properly identifying what the "metric" is. The poster child for this is resolve(deflection) and perception(accuracy). I've talked to and read posts by people who assume that because +1 deflection gives the enemy a -1 penalty on the attack roll and a +1 accuracy gives you a +1 on the attack roll that deflection and accuracy have linear returns. Nothing could be further from the truth. Because the actual metric is "effective health." That is, how much effective health do you have? And as this is the true metric it becomes very clear that deflection/resolve has increasing returns, because at very low deflection another point hardly matters, but at the top-end each point of deflection is so important that eventually it gives you infinite survivability. Accuracy, by contrast, has diminishing returns, because it's the flip side to that deflection equation. When you go from missing all the time to grazing some of the time, you just got an infinite increase in your damage potential (which was previously zero). However, when you already have accuracy so high that you are critting all the time, another point of accuracy will do literally nothing. With regards to action speed and recovery times, a lot of people get hung up on the fact that when it comes to speed adjustments, the more bonuses you have the smaller your reduction in your action time and recovery time, and they therefore conclude that therefore the returns are diminishing. This is wrong for two interrelated reasons. One, the action time/recovery time is not actually the metric. It is in fact just a mere component of our true metric, and is in fact the denominator. Two, because it is the denominator for our true metric, the smaller our starting value, the smaller the change needs to be to accomplish the same net effect. For example, reducing your recovery time by .1s when you're starting at 1.5s is way better than reducing your recovery time by .1s when you're starting at 5s. So just the mere fact that you get less recovery time reduction the more action speed you already have does not, by itself, mean you have diminishing returns. Instead, you have to look at the true metric. So what is the true metric? Basically, damage per second, or damage over time. More generally, it is "how many things can we accomplish in a given amount of time?" Now, does this metric get linear returns from speed bonuses? Or is it diminishing? Or is it increasing? Let's imagine a hypothetical scenario where you attack and on average do 15 damage to the target, and you do so every 5 seconds. Using the action speed equation, we can draw a graph of how much damage you are capable of doing for different levels of +action speed. See that smooth diagonal line going up(*) in the graph below (click to enlargen)? That's literally the definition of linear returns. (*) Note that for a game like Diablo 2 or Diablo 3, it's not quite this simple. At a certain point, because attack animations are connected to whole numbers of frames (frames as in "frames per second"; whole numbers as in no fractional frames) you start running into a "breakpoints" where you actually get 0 returns for a while until you get enough accumulated attack speed improvements to "round" down to the next lower number of frames per attack. So at a certain point it stops being a smooth diagonal line and starts becoming a steadily embiggening staircase. It averages out to be linear returns, but in truth it no longer really is any sort of well-defined returns because the function is no longer differentiable at that point, which was an important part of defining any kind of returns above. It is possible that at the extreme, Deadfire hits similar issues, but in truth it is clear that Deadfire retains recovery time to two decimal places (even if it rounds to one-decimal place in tooltips), and it is likely that it is impossible to accumulate so much action speed so as to hit "breakpoint" issues. Plus, if Deadfire allows for fractional attack frames, then breakpoints are a non-issue altogether. Now one hiccup here is the fact that the way Deadfire treats adjustments to your action time and recovery time is that it has different native units of measurement depending on whether it's a bonus or a penalty (malus). In effect, the native stat for bonuses is action speed. The native stat for maluses is action time. So when you have a -50% recovery time bonus, it is actually truly a +100% action speed adjustment. However, if you have a -20% action speed penalty, it is actually truly a +25% action time adjustment. Why is this relevant? Because it affects how Deadfire combines the numbers behind the scenes. When you're combining bonuses, you translate anything that's not an action speed into an action speed adjustment and then just add them up; you then optionally reconvert it into whatever unit (recovery time adjustment or action speed adjustment) the tool-tip requires; e.g. a -50% recovery time penalty and a +15% action speed bonus becomes a +100% action speed adjustment and a +15% action speed adjustment which becomes a +115% action speed adjustment for the recovery, which turns into a -53.5% recovery time bonus (and just a -13% action time bonus). When you're combining maluses, you translate anything that's not a recovery time penalty into a recovery time adjustment and then just add them up e.g. two -20% action speed adjustments become two +25% recovery time penalties that add to become a +50% recovery time penalty, which you can then reconvert back for display purposes into a -33% action speed adjustment if needed. When you're combining bonuses and maluses, you convert all bonuses into positive action speed adjustments and sum them, and then convert all maluses into negative recovery time adjustments and sum them, and then you subtract the latter from the former even though they are two completely different units of measure; so a -50% recovery time bonus and a -20% action speed adjustment becomes a +100% action speed adjustment minus a +25% recovery time penalty. The resulting number's unit depends on its sign. If it's positive, the resulting answer is determined to be an action speed adjustment. If it's negative, the resulting answer is determined to be a sign-flipped recovery time penalty. This is needless to say weird. Anyway, this is to say that yes, penalties can drag your numbers down because a -20% action speed is actually much more powerful than a +20% action speed. But unlike what MaxQuest says in his otherwise really useful action speed post, it's not just maluses that do this because of double-inversion (unlike damage penalties). For similar reasons, a -50% recovery time bonus is much more powerful than a +50% recovery time penalty. It's because you have to first convert to the "native units" at which point you see that a -20% action speed is actually a +25% recovery time penalty, which is more powerful than the +20% action speed; and the -50% recovery time bonus is actually a +100% action speed bonus which has a larger magnitude than the +50% recovery time penalty. Yes, again, this is weird and confusing. This odd use of native units of measurement also has an effect on the full understanding of our linear returns. When all you have are action speed bonuses, the linear returns are easy to see as a diagonal graph going up and to the right. When all you have are recovery time penalties, it is trivial to see that e.g. each +10% recovery penalty you add to your 5s recovery is a flat .5 second, which is also linear. But when you are combining bonuses and penalties, things get a little harder to compute and things don't add up as trivially. But if you remember about "native units" then it looks a little less weird that a -75% recovery time bonus can cancel out as much as a +300% recovery time penalty (which can make it intuitively feel like there's increasing returns to time/speed modifiers) or that a -20% action speed penalty outweighs a +20% action speed bonus (which can make it intuitively feel like there's diminishing returns to time/speed modifiers). And this is why it's so important that you get x and y right when analyzing whether for an f(x) = y, that f''(x) = 0 . Now, astute observers will note that with linear returns, the more you have of something, the less any further gain is worth relative to what you already have. MaxQuest has called this "intrinsic diminishing returns" for lack of a better term. I don't quite like the terminology because "diminishing returns" has a specific meaning, but I also don't have a better suggestion. Anyway, it is certainly true that if you have +500% action speed, another net +25% action speed is going to be a relatively less impact than when you had +0% action speed. This point is relevant if you're trying to decide between investing in damage or investing in speed, because to maximize total damage over time you want to balance out your bonuses as much as possible (for the same reason that given a rectangle with sides a and b with a fixed combined length of a + b = c, to maximize the area, a = b. In other words you get more area from being a square than from being an extremely skinny rectangle). But if you're not actively concerned about a tradeoff between damage or speed (such as when choosing how to allocate points between might or dexterity) the fact that the relative gain is less and less is completely irrelevant to whether or not you get linear returns, and sort of an orthogonal point altogether. Why? In general, a good way to think about increasing, linear, and diminishing returns is this: if something has increasing returns you generally want to invest a lot in it; if something has diminishing returns a little bit of investment might be worth it but it's definitely not worth it after a certain point(*); if something has linear returns, you're always going to get value out of it. If instead of this being Deadfire and us talking about speed bonuses, we were instead talking about Baldur's Gate and equipment that gives you bonus damage to weapons (like a pair of gloves that might give you +1 to weapon damage rolls), literally no one would be saying "oh I guess you have +5 total damage bonus now. Not worth getting more" unless it was some sort of tradeoff between equipment that gave you +1 damage or one that gave you +1 extra attack. In fact, everyone would probably be trying to stack on as much weapon damage bonus as possible after maximizing their attacks per round. It's the same thing here. When you're not trading off for damage, there's basically no reason to not get more speed if you can. (*) This is very simplified and glosses over a lot of nuance. Something can have such extremely slow increasing returns that it may never be worth investing in, and something can have such extremely slow diminishing returns that over a reasonable range of stats it may never not be worth investing in. Similarly, if every action speed and recovery time adjustment in Deadfire were suddenly decimated to literally one tenth of their current value, even though speed adjustment would still be linear returns, the gains would be so small that even though they would still be linear returns, you would be getting linear crap returns. 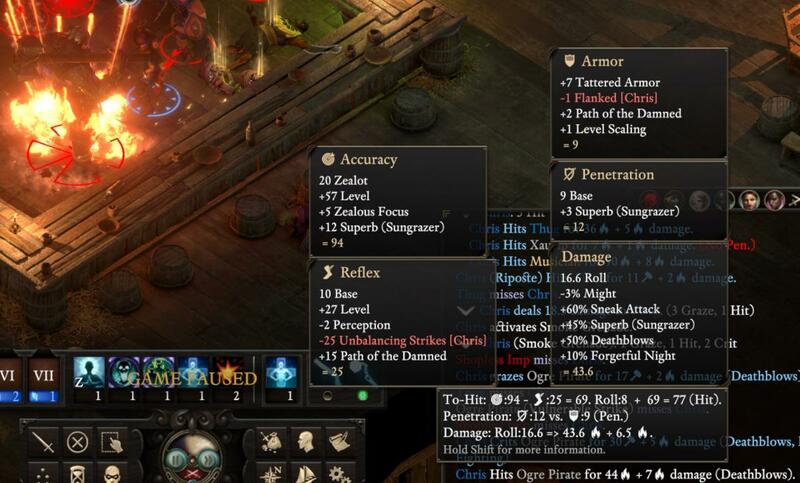 The linear returns for investment in speed works out for us players in Deadfire because in large part Obsidian purposefully balanced speed with damage (see the Might/Dexterity correspondence). So that's it. What are you still doing here? Show's over! Hope you found this useful, entertaining, or at least educational! My name is gkathellar and I endorse anything even tangentially related to Toshiro Umezawa, the single best monoblack heroic character. Huh. I can't seem to get Sneak Attack to work with Explosives. Are you sure it works? Haven't tested for Deathblows yet. The damage numbers I saw were annotated with (Deathblows). I assumed this meant they were also boosted by Sneak Attack, but it's possible that the way Deathblows is implemented it just skips past sneak attack and applies the Deathblows boost directly. I'll edit and remove the sneak attack until I can confirm one way or the other (it might also be a specific subset of explosives). I hired an adventurer and started bombing some poor Tikawarans; Sneak Attack doesn't seem to appear in the damage calculations after shifting over them. 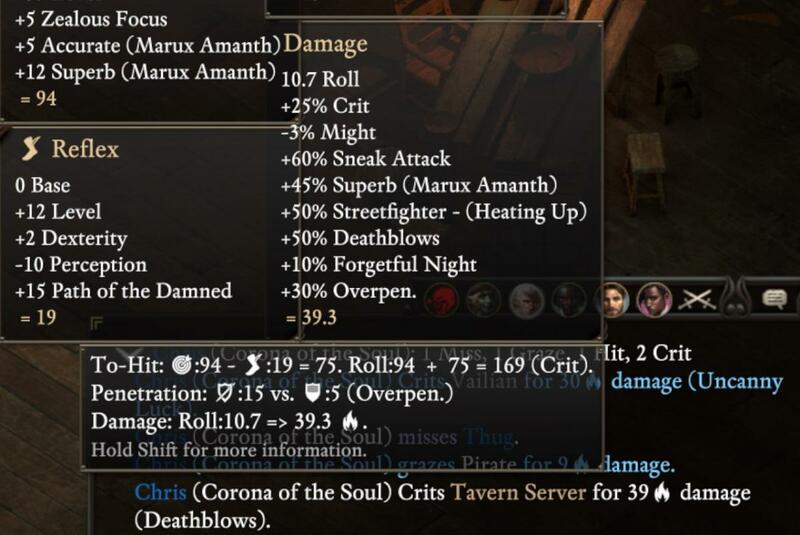 Deathblows appears in the log next to the roll (Deathblows), but hovering over the damage line with Shift only shows rolled damage and Might modifier, which fits the final number shown in the log. I don't think it works, but I don't have enough gameplay experience with this sort of build to "feel" by the heart if damage is really increased but the log doesn't show it or something. And we all know that log doesn't show everything - dots, Recall Agony, and so on. Thanks for looking at this, definitely worth further testing. So... if multiple action speed bonuses have linear returns you should be able to hit 0 action time and recovery if you get enough of them, right? I guess the best way to check it would be to bomb your own party members, to see if the damage from the log and the missing HP on the target are the same. After seeing how Recall Agony works, I wouldn't be surprised if it wasn't shown in log at all. Problem with the potion is that even if every ranged enemy attacking you has 25% under penetration, if there's enough of them you'll still die pretty quickly I definitely drank some potions because it helped, but sometimes I needed both the potion and the large shield modal to survive Deadfire AI sending every ranged attacker against my streetfighter for some reason. Also you need a pretty decent alchemy to get up to that much of an armor rating boost, so it's not an option for early game IIRC. Edit: reading through again, you recommend to max resolve due to "increasing returns" - can you explain what you mean by that? I've been dumping resolve in favor of dex/per/int. Another edit: after googling it looks like cutthroat cosmo is only available on steam installs. Is there a way to get it if you installed on GOG? Yeah, by increasing returns I mean that every point of deflection you gives you progressively better results. I have an example somewhere in the big guide (do a ctrl-f for "Defenses offer increasing returns"). The catch is that resolve is sort of garbage for most characters. The increasing returns means that if you invest heavily into it, you eventually go from it being garbage to it being incredible. If you only do a modest investment (a low deflection character with ~14 resolve wearing a shield and not much more investment) in it then while it won't be crappy, it might not be as good as points you put elsewhere. So depending on the types of characters you are making, you might be perfectly optimized in dumping resolve in favor of dex/per/int. Also, re: cutthroat cosmo, looks like console commands won't work, however someone found a hack for GOG: https://forums.obsidian.net/topic/96805-introducing-the-seafarers-scavenger-hunt/page-2?do=findComment&comment=2027320 Kind of lame that it was a steam-only official promotion, considering how good of a pet it can be. There's another pet - Abraham in Neketaka (Queen's Berth) - reduces armor recovery and heals on kill. There's another pet (forgot the name, I think it's a dog) that does the same as Cosmo - without the gunner buff. So no need to console around. Maybe somebody else knows the name of the pet. I found it pretty early but didn't use it because I had Cosmo. Of curse - I mean a piggy with a hat - come on! Then there must be a third one because I found the one I was takling about somewhere else. I know because I haven't been to Queen's Berth in this playthrough yet. And I also think it didn't heal on kill but did something else. Or my memory is messed up completely and I mix up two pets or so. I'll try to find it and report... when I find the time to load up the game. But yes: you don't need Cosmo for this. Sweet use of Streetfighter/X. I tried Streetfighter/Berzerker, which was definitely powerful but kinda dull since I had very few actives, just spammed Finishing Blow/Barbaric Blow - which competed for killing strikes after upgrading Barb Blow to the refund on kill. Terrible deflection due to frenzy was a problem as well. I was playing on Veteran/Scale up Everything, and I found it difficult to get naturally flanked by mid-game because there just weren't enough enemies in encounters, and they seemed to split their attention between all party members at once. POTD so far seems to have significantly more mooks, might be worth it to try again with a Streetfighter multi. Though the continuous crits and insane damage record on my watcher was satisfying, this looks like a lot more fun, plus with casting abilities to play with. Dual wielding blunderbuss/melee is great for early game, and mad flavorful. I kept wishing that full attacks let me point-blank shot with my gun so I could keep using it later on. I never thought about using sparkcrackers to trigger Heating Up. This is definitely more than just a class guide, great info dump on mechanics. if you do a Riposte while holding a Blunderbuss(Powder Burns)/melee, you will actually trigger the Powder Burns modal effect (both the aoe burn damage and the distraction on yourself) as part of the full attack Riposte, even though you don't appear to trigger the actual base blunderbuss attack. This is probably a bug that will one day get fixed, but it does mean if for some reason you're surrounded but not getting flanked (can happen in odd situations), giving yourself a high deflection and equipping your blunderbuss/melee (with powder burns) is another way to get near-100% uptime on your streetfighter special. In general though I would still prefer equipping two real melee weapons if you don't need the additional help with uptime because the Powder Burns damage tends to be really really crappy (mostly due to perpetual underpenetration) compared to a riposte with two great melee weapons. People calling magic cards that weren't around when I played it nostalgic makes me feel old. I made a custom NPC with a similar build, and thought I'd mentioned something that very much helps me: Triumph of the Crusaders. Basically with the buff active, you get healed to full every time you down an enemy, and with this build you chunk things so fast that it's a big help to survivability. Also you don't have to be in the AoE to get the heal like the text kind of makes it seem. Assuming the buff hasn't run out, you'll get the heal no matter where you are. It's a long one too, 60 secs base. Sorry, just saw that the above post already answer this question .